Getting a Client. Keeping a Client. You know how you see or read or hear things which leave an indelible impression on you, however small the original thing might be? One of those things is something I know I first became aware of back when I was running my own accountancy business, and I have a feeling it was something put out by The Post Office, as Royal Mail used to be known. They were talking about client acquisition, specifically direct mail that – obviously – being something the PO wanted to encourage back then. The article pointed out that acquiring a client was one thing, a good thing obviously. But keeping a client was quite another and that other being highly desirable because the costs of the original acquisition can be expensive in time and money. The original client can be hard won. I am reminded of buying a house. That’s the hard bit. Finding one you want, crossing your fingers for months on end that the survey’s OK and someone will lend you the money to buy it and then funding the stamp duty and so on. Relative to selling it, buying’s the hard bit and once I’ve done the hard bit I tend to want to hang on to it, especially nowadays. So it is with clients. Once you have them, you want to keep them. Not at all costs and not all of them, but most of them most of the time. So our job is to make it easy for clients to stay and to return. Loyalty is a quality I value very highly in all areas of my life. I am loyal (until you push me beyond acceptable limits!). Are you looking after your clients once you have them? Are you making them feel as you would want to feel if you were a client of your own business? Or are you putting all your efforts into the acquisition of more and more and more? Are you addicted to new business? Why? That’s the hard bit. You’ve got some lovely clients now. Nuture them. Make it easy for them to stay. My client Sam recommended a book to me which Nicola and I also debate on the Own It! the podcast. 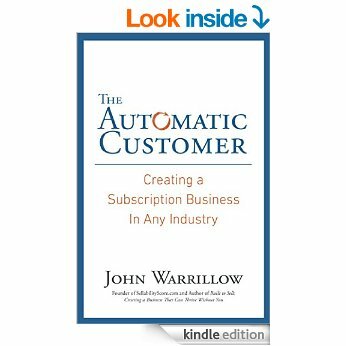 It’s called The Automatic Customer: Creating a Subscription Business in Any Industry and it’s chock full of ideas about how to make it easy for potential clients to become clients and to remain clients. I would urge you to read it even if you think you don’t want to create a subscription business because it is an easy read and I think it will give you ideas for how you can improve your business model for the mutual benefit of your clients and your business. And then you can discuss those with me, your business mentor. Repeat business, that’s the name of this game. Buying a house or getting a client is much harder than hanging onto the one you’ve got, lovingly. Don’t put yourself through that unnecessarily. It’s exhausting.